There's the "Can we find it?" kind of challenge. And the "I'm ready to start cooking! Oh, crap! I don't have any [insert ingredient we thought we might have but actually have to make it in advance instead] on hand" kind of challenge. "Having it" is something different altogether. In reading the recipes, most involve some multicomponent item that needs to be prepped the day before or longer. (Another challenge that can be remedied by planning! Good thing we love lists! Woo hoo for planning!) 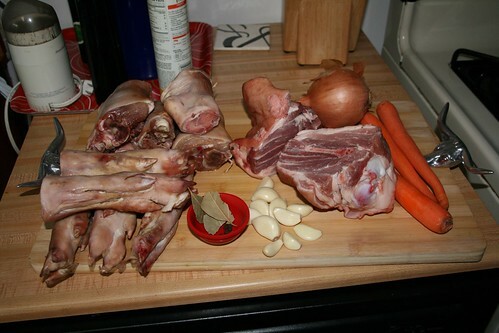 One of these items is pork stock, and lots of it. 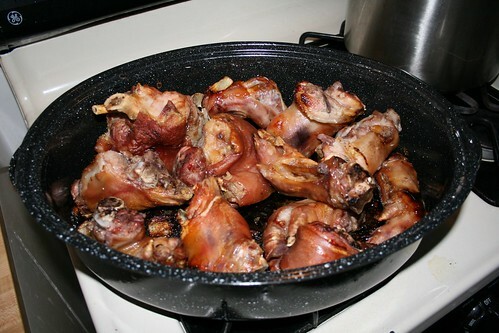 It is listed in a good half the recipes (without a recipe for the stock itself), so by golly, we intend to be come experts on pork stock making! 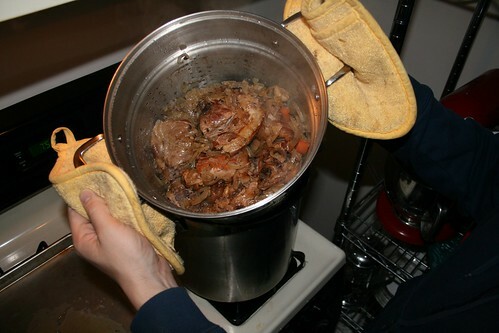 Having never made pork stock before (we are mere chicken stock makers, but still firm believers in the power of homemade stock), we looked around for some guidance with the big G (a search engine that rhymes with zoogle) and found a promising recipe on Serious Eats. (They even mention the very soup we are about to make!) Coincidence? You decide. 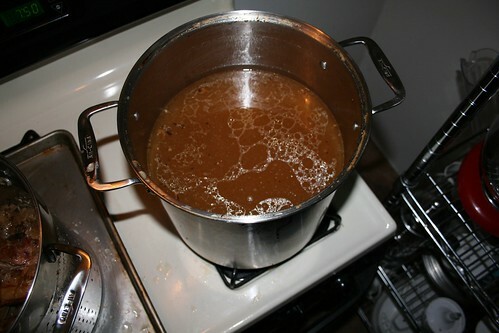 So, we dove on in and made some pork stock to get this party started! Pork Stock adapted from the Zuni Café Cookbook, adapted from Serious Eats. and of course, some white wine. 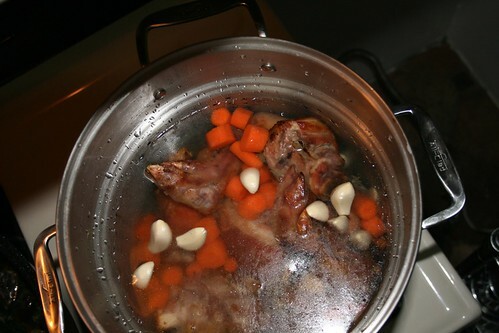 Move bones to giant stock pot, add more onions and garlic, carrots and spices, cover with cold water. Meanwhile, add some leftover white wine to deglaze the roasting pan. (Leftover wine? Yes. It's true. It was an accident, we promise it will never happen again.) Add the roasting pan bits to the stock pot. 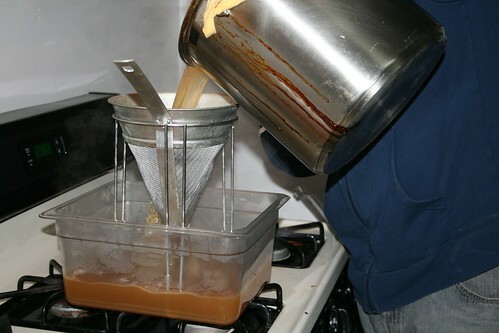 Then give it a good go with a chinois or some other fine mesh sieve. Allow to cool and refrigerate and salivate at the idea of finally making the first recipe from this book!!! Note to selves: Homemade stock ROCKS! We should remember to use it more often. Blast from the past: Read about us and what the eff we're doing with this project from his and her perspective.